The IDEALIS is a new kind of open access overlay journal, powered by PressForward and curated by librarian-experts working in the arena of scholarly communication research. recognize those authors who have made their work open access (OA). Sign up now to receive high-quality, open access LIS research related to all aspects of scholarly communication, via email, Twitter, or RSS. 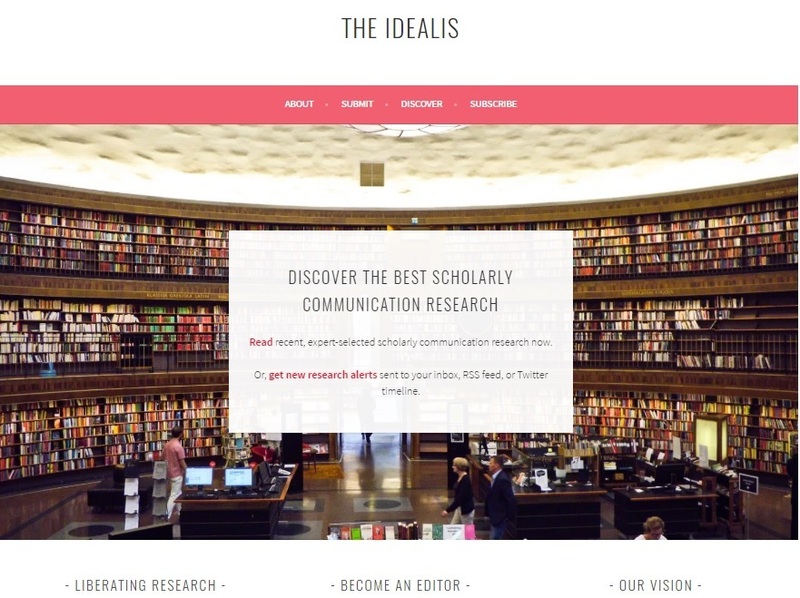 Each week, IDEALIS editors will recruit the very best scholarly communication literature from across the Web, working with authors to make their research available, ensuring that librarians are connected to excellent research that’s relevant to their work. The IDEALIS uses the greatest information resource known to humankind–librarians, in order to create a carefully curated journal full of research that is relevant first and foremost to the needs of library practitioners who are interested in scholarly communication. THE IDEALIS aims to liberate toll access or otherwise difficult to access research in all forms: articles, books, code, data sets, presentations, white papers, and more, with all the tools at disposal. HAVE A PREFERENCE FOR WHAT THE IDEALIS WILL ADD NEXT ? Email THE IDEALIS team ! Learn more about THE IDEALIS - HERE.